Porsche returns to rally racing! 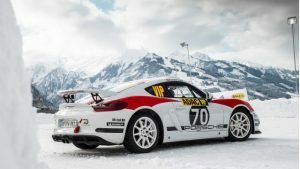 Those attending the Porsche Winter Event held before the GP Ice Race in Zell am See, Austria were able to see the new concept car, which has been designed for drivability and sustainability; two key factors in Porsche’s rally car engineering philosophy. Why has Porsche decided to return to rally racing? Perhaps the answer lies in the fact that during the 1980s, Porsche was a leader in this sport with its 911 SC RS and 959 Group B models. It seems that such was the Porsche fan enthusiasm for the concept model shown in 2018 that the firm decided it was time to get back into competitive motor sports. Plus, the customer racers who race the car in the R-GT class will have the chance to tap into a little bit of that greatness when the production rally car is ready for the 2020 season. Would you like to drive a Porsche rally car? It would be an offer that it would be hard to turn down! Hire a Porsche from Titanium Luxury Hire and enjoy the sensations that Porsche fans have enthused about for decades. All you have to do is choose your model and Contact Us – we’ll take care of everything else.